Have you ever been to the Florida Keys for vacation? Don't be like me and spend 40 years in the state of Florida and not take a trip to the Keys. How many places in the world can you stand in the same spot and see the sun rise out of one ocean and set in another ocean? That's just one of the highlights of spending your next vacation in the Keys. There is so much to do and see in the FL Keys that you could spend the rest of your life here. It really is a great place to vacation and spend lots of time just unwinding and enjoying a slower pace of life. One of the most popular places to go in the Florida Keys is John Pennekamp State Park where you can camp, picnic, ride your bike, take a snorkeling or scuba tour, ride in a glass bottom boat over the coral reef, rent a boat or sea kayak or partake of several other activities all related to water and boating. John Pennekamp State Park is located at mile marker 102.5 on US1 and encompasses 178 square miles of coral reefs and a large park on land. Some of the most popular islands that people visit while in the Keys are Key Largo, Bahia Honda Key, Fiesta Key, Islamorada which incorporates 5 major keys, No Name Key, Cudjoe Key, Shark Key and of course Key West. The Florida Keys are actually made up of around 1,700 individual islands most of which are only accessible by boat. 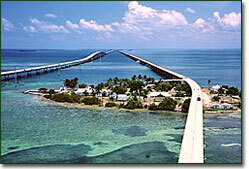 There is also the Seven Mile Bridge people like to just drive across because it's so long. With all there is to do and the large strip of highway the Keys make up there are thousands of places to stay while vacationing here. You can camp, stay in a vacation rental, condo, private home, cottage, bed and breakfast, hotel, resort and on and on. The choices are absolutely endless. The level of Florida Keys accommodations are also endless as well. You can find a place to camp for around $25 to $30 per night and you can find a hotel or small resort for as little as $100 to $120 per night and then there are luxury accommodations in the Florida Keys that can go as high as $10,000 or more per week. What's the best way to choose your accommodations? Click on the link below and read about what other travelers say about the many vacation rentals and accommodations in the Florida Keys.